As investment approvals by the Philippine Economic Zone Authority (PEZA) declined in all industry sectors, the information technology (IT) sector bucked the trend, with investments picking up and posting a nine percent growth in the nine months to September this year. The Duterte administration’s budget deficit remained well below ceiling in the first nine-months of the year owing to higher revenue collections amid above-target expenditures, data from the Bureau of the Treasury showed. The latest global competitiveness rankings by the World Economic Forum (WEF) showed encouraging trends among Asean nations, with Singapore leading the way and the Philippines showing the greatest improvement from last year. A Philippine court has rejected a petition by President Rodrigo Duterte’s administration to have his fiercest critic in the Senate arrested, in a legal setback for Duterte that the senator called a victory for democracy. THE PHILIPPINES is one of the countries with the largest insurance gap even as the country is susceptible to natural disasters and effects of climate change, a report from Lloyd’s said. The resource-rich Philippines is doubling up development of its own fuel sources as world oil price hikes hit the largely impoverished population. The tax reform for acceleration and inclusion (TRAIN) law failed to deliver to the expected revenues in the first eight months of the year after collections from consumption levy incurred losses instead of income. The inter-agency Development Budget Coordination Committee (DBCC) has trimmed the national government’s 2019 revenue program to P3.159 trillion due to the proposed suspension of the next increase in fuel excise taxes, the Department of Finance (DOF) said yesterday. The poorest or bottom 30% income households felt inflation at 8% in August 2018, according to the latest release from the Philippine Statistics Authority (PSA). LABOR groups sought President Rodrigo Duterte’s intervention for a “substantial” wage increase for some 4 million wage earners in Metro Manila, after a consultation on Monday with the Regional Tripartite Wages and Productivity Board-National Capital Region (RTWPB-NCR). More than 50,000 skilled workers from the Philippines could be employed in Japan in the next six years once Prime Minister Shinzo Abe’s government finalises its new rules for giving temporary residence to foreign blue-collar workers, reports Rappler. THE Department of Finance (DOF) has presented to the Senate its 2019 proposed budget of P56.86 billion under the cash-based scheme, which includes support for its attached agencies. THE steady influx of Chinese visitors and investors to the Philippines bodes well for the country’s real estate industry. French shipbuilder OCEA has dispatched the final two Boracay-(OCEA FPB 72 Mk II) class patrol vessels on order for the Philippine Coast Guard (PCG). The National Irrigation Administration has opened the new P74-million pumping station of the Libmanan-Cabusao pump irrigation system (LCPIS) as part of the government’s effort to cover more agricultural areas nationwide. RIDE-HAILING app Grab is buttressing its safety features even as it was deemed 95 times safer compared to other modes of transportation. MORE banks in Southeast Asia have realized that climate change is a big business issue. Prices of construction materials in Metro Manila grew slower in September, the Philippine Statistics Authority (PSA) reported. Philippine authorities said Monday they have launched a probe into the mass slaying of nine farmers gunned down after taking over part of a sugar plantation to grow food for themselves. A total reward of PHP500,000 has been offered for any information that could lead to the arrest of the suspects in the massacre of sugarcane workers in Sagay City, Negros Occidental on Saturday night. A Makati court upheld the validity of President Rodrigo Duterte’s proclamation against the grant of amnesty to Senator Antonio Trillanes IV. JOINT ventures (JV) with foreign players in the low-cost and economic housing sector may help address the housing backlog in the Philippines, according to Pinnacle Real Estate Consulting, Inc. The Philippines will collaborate with China for various developments in the agriculture sector. 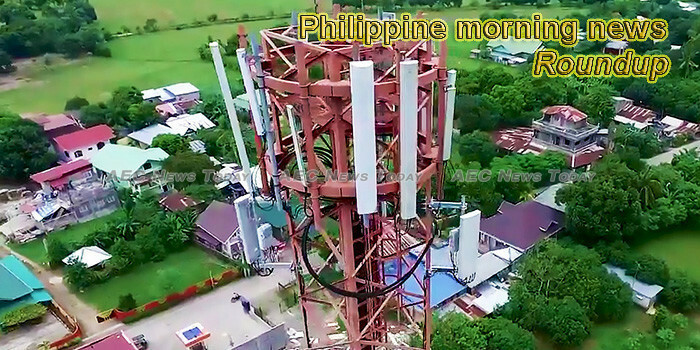 The Department of Information and Communications Technology (DICT) said on Monday the selection process for the Philippines’ third major telecommunications company may be delayed by a suit lodged by NOW Telecom against the National Telecommunications Commission (NTC). Philippine banks are now looking at financing sustainable projects to combat the adverse effects of climate change, the Bankers Association of the Philippines (BAP) said Monday. To ease overcrowding in the detention cells of its police stations, the Quezon City government has come up with a new way of dealing with all ordinance violators instead of jailing them outright. Close to 600 banana plantation workers and peasants from Compostela Valley province were flagged down by Task Force Davao here Monday afternoon in an attempt to bar the entry of workers in the city. A police official who was sacked for his alleged involvement in irregularities in the purchase of three police helicopters nine years ago has been vindicated after the Supreme Court affirmed the Court of Appeals’ reversal of a resolution of the Office of the Ombudsman dismissing him from the service. This week’s Philippines morning news feature photo acknowledges World Development Information Day, October 24.